Is it crazy to avoid the behaviors that make you crazy? Or is it crazy to medicate so that you can sustain a life that makes you crazy? Joan Didion is one of the most beloved American writers, and she also happens to have MS. Recently I found out her birthday is on the day I was diagnosed three years ago. So I guess today it’s happy birthday to her – and to me. In a way, it’s like a different person was born on the day I heard the words “multiple sclerosis”. It’s a cliché, but it’s true: life was never again the same. Even though I continued to go to work everyday and tried as hard as I could to lead a normal life, changes were gradually happening inside me. I became more relaxed about some things, and yet even more worried and anxious about others. I began to listen to myself more, especially my needs, and not caring so much about what other people think. I try to take better care of myself. Weird as it may sound, my self-esteem actually got better in many ways. I’ve been gathering my strengths and working on strategies in order not to let anyone treat me disrespectfully anymore. It’s like I’m proud of everything I’ve accomplished even with limitations most people don’t dream of, so there’s no way they’re going to bring me down. I go after the things I need more easily instead of being shy and insecure about them and doubting myself. I’m working on not depleting all my energies when I go after something. And of course this all sounds very inspiring and pretty, but let’s not kid ourselves – it didn’t happen overnight and it isn’t like this every day. It’s a work in progress, a process. There are setbacks. Things I need to work on more. Things that I don’t get right on a first try. Or a second. But as much as I hate having MS and as much as it scares me, it was a much needed wake up call and a chance to make some changes along my self-development path. Joan Didion on being diagnosed: “I had … a sharp apprehension of what it was like to open the door to the stranger and find that the stranger did indeed have the knife.” It’s so true and it brilliantly sums up what I felt three years ago. But let’s not forget that we all with no exception possess self-defense tools and techniques to face up to that stranger with the knife. We need to find them, develop them and use them. We will be fine. I already shared this article on Twitter but I thought I’d share it here too. It’s by Andrew Solomon, whose TED Talk swept me away some months ago, and I must confess I feel a little guilty because I haven’t yet started reading his book on depression, The Noonday Demon. I was delighted to find his new article on The Guardian though. As with his TED Talk, the words are vivid, fluid and meaningful, and he addresses many of my feelings, concerns and thoughts about depression. I stole the title of this post from one of the chapters in the book When the Body Says No, by Dr Gabor Mate, because it said a lot of interesting things about positive and negative attitudes towards chronic illness, which is what I want to rant about. And then I found other communities that were the exact opposite. At first, I wanted to jump on the positive wagon. I mean, who doesn’t want to be surrounded by positivity, right? But then again… I changed my mind. Some of the people who are members of these communities are bloggers and guest bloggers that go around the internet giving you tips and recipes to manage your day, your symptoms and your well-being. But some of them, if you follow them on Twitter, spend their days complaining about how their legs gave in, they couldn’t leave the house, they were in such pain, etc. And it gets depressing. More depressing than the depressing communities. Because these people sound like – and here comes an ugly word – hypocrites. There, I said it. Another thing that’s bothering me is their advice. This week I clicked on a link to a blog post with tips to managing brain fog. I suffer a lot from brain fog so I was interested. And then I was disappointed. The tips included “Take naps along the day” which I would love to but I’m working 9 to 5 and I can’t really nap in the office, “Drink lots of water” which is lovely but I’m already drinking 2 liters a day, should I really drink more and become a swimming pool?, and “Cut on caffeine”, another great tip since I only drink one coffee a day. There’s probably a chance these tips are going to help someone, but to me they just felt unrealistic, childish and indulgent. But that’s not the biggest problem I have with all this positivity. Today I watched an interview on a news channel with a fellow MSer about my age that really pissed me off. Among other things, she said that if you believed in your dreams you could make them come true. I may be a little skeptical and sound a little mean here, but I’ve lived enough to know that’s not true when you have such a debilitating condition like multiple sclerosis. I don’t believe in unicorns. I believe that if you’re strong-willed, if you have supportive people around you, a great team of healthcare providers and – let’s not kid ourselves – some money, you can make things happen, yes. Statements like “Just believe you can” are not only misleading but they can be offensive too. I’ve read stories that made me feel like I’m not a worthy MSer just because I can’t run the marathon or climb the Everest. I could barely run 4 miles after 4 months of training, before I gave up because of the winter. Oh yes, I forgot to mention that I’m the only MSer who isn’t bothered by the heat, it’s the cold that gets to me, so I guess that’s another reason I’m probably not a worthy member of the family. I could write a great post with tips for all of you to survive the summer (try being born in a Mediterranean country, you’ll grow up used to really hot and really long summers) but I don’t pretend to know what works best for you and preach about it. Everyone is different. And no, it’s not great to have a chronic illness and have to deal with things most people don’t even dream of, so don’t make it sound like it is. Yes, there are good days too, and humor in many situations, but you can feel it when it’s authentic and when it’s not. “Compulsive optimism is one of the ways we bind our anxiety to avoid confronting it. […] The onset of symptoms or the diagnosis of a disease should prompt a two-pronged inquiry: what is this illness saying about the past and present, and what will help in the future? Many approaches focus only on the second half of that healing dyad without considering fully what led to the manifestation of illness in the first place. Such ‘positive’ methods fill the bookshelves and the airwaves. Last night a conversation started on Twitter about the triggers of multiple sclerosis and the question if an unhappy and stressful childhood could have messed up the immune system. I mentioned I lived my childhood with chronic stress and that has been proved to influence the immune system. When I woke up today a lot of people had stepped in with different opinions. Some of them acknowledged they had difficult family backgrounds, someone noted that while having had an unhappy childhood their brothers and sisters were fine, someone blamed it on a bacterial infection and some people mentioned genes were the only factor involved. Each of our 20,000 or so genes specifies the construction of a specific protein; proteins shape the structure and function of cells, the communication between them, and their collectivity as organisms. Scientists once thought that, starting at the beginning of a chromosome, there’d be a stretch of DNA coding for gene A, which directed the construction of protein A. Immediately after that would be the DNA coding for gene B, specifying for protein B, followed by gene C, and so on. But this turned out to be wrong. Between the stretches of DNA coding for two genes came a stretch of ‘non-coding’ DNA, once pejoratively called ‘junk DNA’, of no obvious use. Then came the astonishing discovery that approximately 95 per cent of DNA is non-coding. It can’t be that nearly all of DNA is junk; instead, much of that 95 per cent is the instruction manual for using genes. More specifically, these ‘regulatory elements’ are the on-off switches determining when and how much a particular gene is transcribed (ie, prodded into instigating the construction of its protein). Just before the start of the DNA coding for a gene is a stretch of regulatory DNA constituting that gene’s ‘promoter’. If a particular ‘transcription factor’ comes floating over from somewhere in the cell and binds to that promoter, this triggers transcription of that gene. So what could trigger these “transcription factors”? The answer is the environment. And environment can mean a lot of different things. That’s when lifestyle, infections, stress, emotions, etc., come in. In other words, you can have the genes that predispose you to develop multiple sclerosis, but without the right triggers you have a chance of never developing it. If it wasn’t the case, twins would suffer from the same conditions, and we know that’s not always true. I once printed and handed out this poem to my therapist, because I was so desperate from being incessantly misunderstood and misdiagnosed. It’s one of my favorites still. When I was diagnosed with multiple sclerosis, my neurologist explained to me in broad terms what happened in the brain of people with this condition. I realized it was an autoimmune disease, to which she said yes, it could be considered an autoimmune disease. I sobbed a little more (I sobbed the whole time) and asked her “So this is another way I found to hurt myself?” She told me not to think about it that way but looking back it makes perfect sense that I have an autoimmune disease (two, if you count with endometriosis). I never tolerated myself much, always brought myself down, and due to specific circumstances in my upbringing I never had much emotional independence, sense of self, or psychological boundaries. So no wonder my body was confused and shooting whatever seemed like a nice thing to shoot. 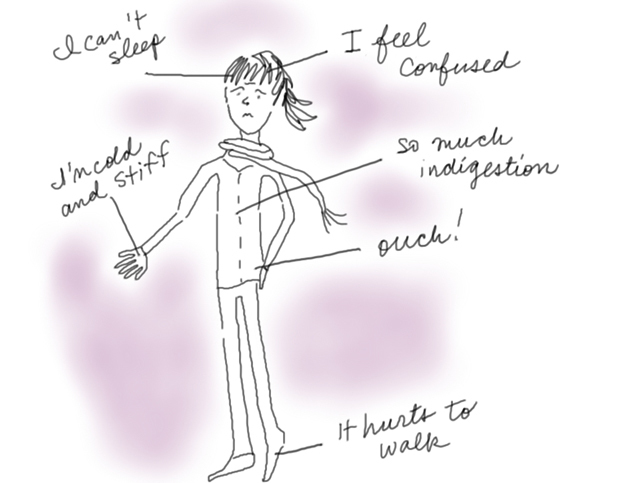 Autoimmunity fascinates me from every perspective. From a biological point of view, it’s not very smart, is it? It’s just pure self-destruction. From a psychological point of view, can our body really reflect a poor sense of self? Or is there more to it that we don’t even dream of? It remains a mystery, one that scientists are still trying to find answers to. And the list of autoimmune diseases keeps growing, as evidence suggests well-known diseases such as schizophrenia may have an autoimmune pathogenesis. Wikipedia lists many of these with links to scientific articles. It’s worth taking a look. This unfortunately makes perfect sense to me considering my personal history. I’m not sure how it applies to the millions of people diagnosed with these diseases but I think it adds a valuable ingredient to the genetic and environmental factors we know about. You see, I always wondered why my sister had mono when I was 8 and I didn’t catch it then, even though I would steal her lipsticks and drink from the same cups. I caught it when I was 18. And why when exposed to the same flu virus some people are bed-ridden and other just have mild symptoms? The virus is the same, right? So there’s got to be something in our immune systems, which in turn are highly influenced by our emotions, that determines whether we’re going to get sick or not. The reasons for psychosomatic disorders can be varied, but they are usually linked to an ongoing stressful life situation which, for one reason or another, sufferers cannot (or feel they should not) air. This can be an untenable situation at work where they are required to do jobs which they have not been trained to do, an unpleasant work atmosphere, frequent arguments at work or at home, feeling burdened by great responsibilities without getting recognition, or aggravation over an ongoing situation such as a long-term project at work or problems with difficult children or difficult parents. It is really surprising how resilient the body is to stress. Emotional upset often needs to go on for a long time before the body’s defences break down or, to put it more precisely, before we notice the body is suffering from the emotional onslaught. The body has an incredibly efficient way of recuperating, so when we find we cannot recover from an illness this indicates we must have run down our resources. This is a warning signal that must be taken seriously or we risk even graver physical problems.